Shush or Shushiana or Suziana today called in English Susa is truly a haven for archeologists and tourists who are interested in historical monuments and remains. It is said to have a history originating in prehistoric times but it was first truly developed by the Elamites to become their capital. Later, when the Achaemenids took over the kingdom, Shush retained its glory and importance and was selected by Darius as his winter capital and remained as such during the eras of both Achaemenids and Sassanids. Shush lost its grandeur after the Arab conquest of Iran but began to flourish again in the 9th century but it was reduced to rubbles when the Mongols conquered it. In 1849 archeologists began exploration of the ancient city, by then a poor little town surrounded by remains of ancient monuments, and they found magnificent archeological sites and objects. In 1898 De Morgan built on the Acropol hill an enormous fort of stone and mortar as the residence for his team of archeologists. This fort still exists and is used by the Cultural Heritage Organization. The followings are the important sites that tourists may visit in this region. The only things that remain of this Palace are the bases of the stone columns and parts of a brick wall with baked bricks as the facade. The Palace consisted of various parts, traces of which can be seen today: the Reception Hall, the Harem, the Gate, a Hall for dining and three courtyards within the complex. The walls that remain were decorated at one time with baked tiles depicting soldiers and the Eternal Guards, winged lions, and water lilies. Remains of these are today kept in the best museums in Iran and across the globe. A good part of this Palace caught fire during the reign of Ardeshir (Artaxerxes) I (461 BC) but was rebuilt by Ardeshir II (404-359 BC). It was later completely destroyed at the hand of Alexander the Great. This Palace is located 20 km northwest of the ruins of Shush City and on the right side of Karkheh River. It belongs to the Sassanid era and is locally called Kut-e-Karkhe but the correct name is Eivan-e-Karkheh and is thus recorded in the lists of Iran's Cultural Heritage. The remains indicate that it was a beautiful palace worthy of kings and princes. Close to this Palace lies the remains of a fort. 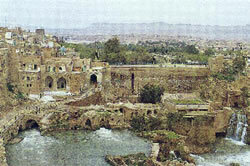 The remains of this palace are found on the western side of the River Shaur facing the shrine of Prophet Daniel. Its columns were of stone and the walls of mud brick and it was used for some time as the seat of the local governor. 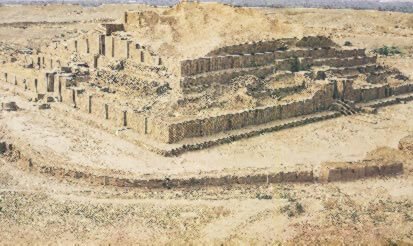 Cheghazanbil, which is a temple dating back to the era of the late Elamites, is located 45 km southeast of Shush. The temple is 1300 m long and 100 m wide and was built c 1300 BC. The River Dez runs at a distance of 2 km from the Temple. At one time it was known as Durantash or Antashgal. It was protected by three walls of sun-dried bricks all around with gates on the eastern side. The royal palace and graveyards were located between the first and second walls. Between the second and third walls was located the water treatment plant which is one of the oldest of such plants ever to have existed. The Temple's water requirements were secured by means of a canal that brought water from Dez River. The main building of the Temple measures 105 m x 105 m with its four sides lying in the four directions of North, South, East and West. Originally it was five floors and 52 m high. The idols were placed on the fifth floor, the most important of which was the god Inshushinak or Shush's especial god. King Untash Gal who built the Temple has left inscriptions pointing out that he built a tall building unlike what previous kings used to build and donated it to the gods Inshushinak and Homban and adds "Let the building and the pains I took be donated to them and let the grace and kindness of Homban and Inshushinak remain here everlastingly". On the sides of the sun baked bricks all around the Temple, on every few layers of bricks the name of the king and his aim in building it is repeated again and again. In the main courtyard there are two small platforms of circular cross-section. Many views have been expressed about them, some knowing them to be altars of sacrifice and others sun-based time measuring platforms. The temple/city together with all the works of the Elamites that had been built on the Seven Hills were destroyed in 640 BC in the Assyrian invasion led by the king Ashurbanipal. Along the distance of 5 km, between the City of Shush and Cheghazanbil there were seven hills on which holy shrines were built. Excavations have so far revealed numerous graves, ceramic articles such as inscriptions, tablets, and many bronze items. These lie on the west of Shush City and are known as the King's City. Many significant archeological items from the ages of the Elamites, Achaemenids, Parthians, and Sassanians have been found in these hills. The city lies at a depths of 15 m below the earth. It consists of many streets and alleys, homes, and public buildings, indicating the existence of generations of humans of relatively advanced civilizations. This Prophet's tomb is located on the east of River Shaur facing the Shush Hill. The Shrine has a courtyard with many rooms surrounding it that pilgrims can stay in while on their pilgrimage. Daniel is a prophet for Jews, Christians and Moslems.